Well. . .even though the calendar says Spring starts tomorrow, we won’t be enjoying Spring-like temperatures for a while yet. Today was rather nice in the DC-Baltimore area as temperatures approached 60. The funny part, this happened after the cold front went through this morning. . .thank you downslope winds! Ahead of the front, we didn’t get out of the 30s! It’s amazing living here sometimes. Since moving to this area I have experienced two hurricanes, an earthquake, a derecho, two relatively snow-less winters, and multiple 100+ degree days. So what gives with this pattern? 12z GFS initial 500 mb heights and vorticity on 03/19/13. The image above shows the main culprit of our cold pattern highlighted with the red circle. That area is a ridge or bubble of high pressure that is now blocking the flow. This forces colder air from Canada south towards the U.S., while storms have to go around. This block is expected to persist and may lead to more antics starting this weekend. As a reference, the 558 height line in Greenland is the same as it was over NJ this morning. Just a bit unusual. . . This means that “Spring” has literally gone to the Arctic! The Arctic Oscillation forecast valid on 03/19/13. The North Atlantic Oscillation forecast valid on 03/19/13. The Arctic Oscillation (AO) and North Atlantic Oscillation (NAO) forecasts above show that both indices are going to remain negative for the next few days. In fact, the AO is going to tank in the next 48 hours, which will drag the NAO with it as they are both calculated near each other. What does this mean for your forecast? It’s going to stay cold if not get colder as we head towards the weekend. The storm track will remain quite active and it’s possible that many areas will see one or two more snowstorms. On the warm side, there may be a couple opportunities for severe weather, but limited to the Gulf Coast. The Climate Prediction Center (CPC) 6-10 day temperature forecast probabilities issued on 03/19/13. The CPC 6-10 day precipitation forecast probabilities issued on 03/19/13. To put these forecast ideas into perspective, I included the Climate Prediction Center’s 6-10 day temperature and precipitation probability forecasts above. It’s extremely rare to see 90% probabilities of below normal temperatures. Notice the increased chances of precipitation along the East Coast? With cold air and precipitation, even in late March or early April, one has to watch for surprise snow. Is it too late for DC-Baltimore-Philadelphia? Personally, I think I’m too jaded to get hopeful, but this pattern tells me to watch out! These are the blog posts I dread writing. I’m not going to make excuses for such a busted snowfall forecast along the I-95 corridor in this one. Oddly enough, I did better forecasting the snow in central and northern VA. The Shenandoah Valley area got 15″-20″ of snow in spots. So wha happened (bonus points for getting the reference)? 12z NAM 850 mb (~5000 ft) wind, heights, and vorticity valid at 1 pm EST on 03/06/2013. Plain and simple, the models were too cold in the end and we as meteorologists blew it. Now, before I go into details, let me just say that you were warned there would be a storm. . .and it’s a big one. Places got lots of snow, many got rain in areas that were supposed to see snow, and very strong winds are still battering the NJ coast down to the Delmarva (57 mph gust in Seaside Park, NJ and 70 mph gust in Lewes, DE). So where did the forecast go bad? I included a 850 mb or 5000 ft snapshot from the 12z NAM and highlighted the culprit. That red circle indicates an area of strong wind out of the east, which effectively produced a warm marine layer that extended to the surface. It was snowing very hard above this layer, but melted on the way down. End result, rain mixed with snowballs at times and very ornery people for missing out on yet another storm. March storms get me all the time!!! Explanation aside, where do we go from here? Mt. 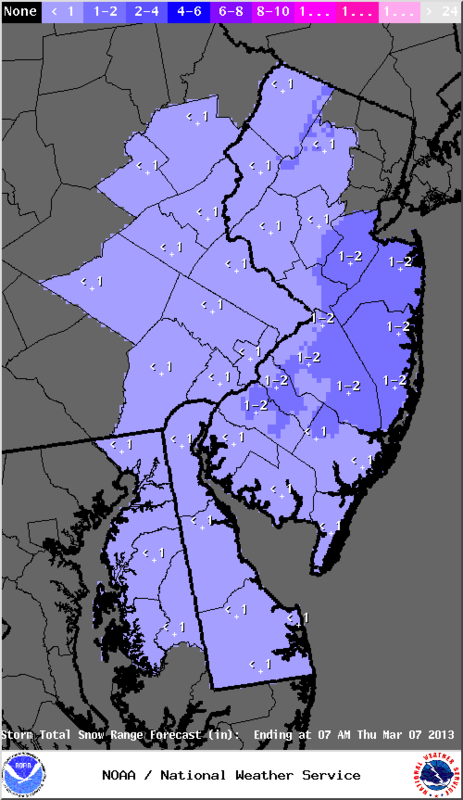 Holly, NJ NWS snowfall accumulation map valid on 03/06/2013. Well, it’s still possible NJ gets some snow, but I’m going to be pessimistic and say that accumulations will be tough. As of this moment, I think coastal areas in the map above get close to 1″, if that. The big story will continue to be wind tonight and another high tide to worry about at 3 am EST. There will be another disturbance dropping around the backside of this very large storm on Friday that could produce more rain and snow showers from NJ possibly as far west as Baltimore. I will admit, I’m rather jaded, but I’ll get over it. I apologize for not seeing this sooner and will pay more attention to these things: wind direction, time of day, March, snow drought, and my perpetual bubble of stability. So, I’m going to be honest with you. When I saw the models trending towards the prospects of this storm, I was torn between thinking it was too good to be true and really wanting to see my first significant snowstorm since moving back to the Mid-Atlantic. We have even joked at work that the lack of snow this past two years is most likely due to my “stable dome of nice weather.” Then again, the tropics have been quite the uninvited guest since I returned, so I think there are people on both sides of this split-weather personality of mine that would like me to move. Be careful what you wish for. . . Anyway, let’s get down to business. Yes, a storm is coming and looks to deliver some wet, heavy snowfall from the mountains of VA/WV into MD. The big questions I have are based on the possibility of more than 8″ of snow from DC through Baltimore to near the MD/PA border. I will be conservative to start with most places east of the Blue Ridge and along the I-95 corridor getting at least 8″, but my gut says this could be 12″ or more. I just can’t figure out if I want it to happen so badly that I’m defying logic. At this juncture, I don’t think so. For NJ, Philly, on up to NYC, this is going to be even tougher. With easterly flow, I think most of the precipitation that falls will be in the form of rain, but as the deformation zone (cold side of the storm with heavy precipitation) develops and moves east, it will most likely change to snow all the way to the coast. I think you have a better chance of seeing accumulating snow (more than 1″) from Toms River on south, but if the storm turns more left or north, higher amounts will spread up the coast into New England, including NYC. Sterling NWS snowfall accumulation forecast totals up to 1 pm Weds, valid on 3/4/2013. Mt. 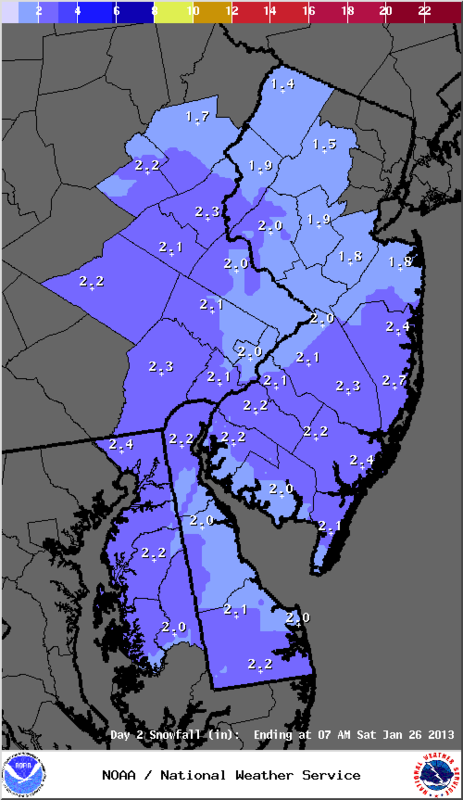 Holly, NJ NWS accumulating snowfall forecast totals through 7 am Thursday, valid on 03/04/2013. The two forecast snowfall accumulation maps above were issued by the Baltimore-Washington National Weather Service (NWS) and Mt. Holly, NJ NWS offices this afternoon. So far, they are in agreement with my initial thoughts, but I do think that areas along I-95 will see more snow above the projected 4″-6″. For NJ, there is more uncertainty with the exact path of the surface low and associated deformation zone. 18z NAM surface pressure and 60-hour accumulated precipitation valid at 1 am EST on 03/07/2013. For kicks, I included the latest (18z) NAM surface pressure and 60-hour accumulated precipitation forecast valid at 1 am EST on 03/07/2013 (Thursday). That is ~2″ of liquid equivalent over the DC-Baltimore corridor stretching to southern NJ with more precipitation after this stretching up through NYC and southern New England. 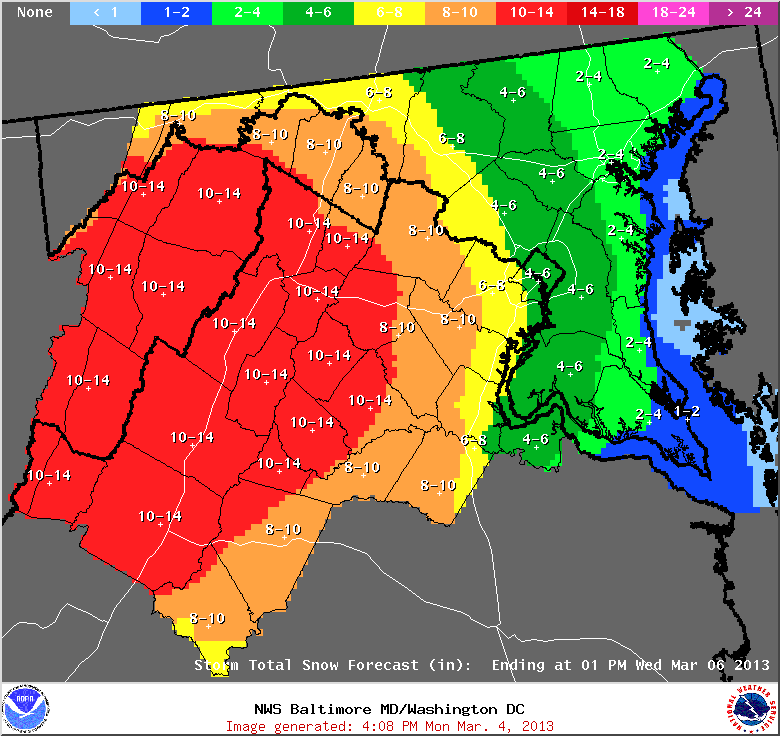 If this verified, the DC-Baltimore area would stand the chance of receiving 12″-18″ of snow. NJ would get about 1″-1.50″ of rain followed by a thumping of snow at the end. 18z GFS forecasted surface pressure and 3-hourly precipitation forecast valid at 7 pm EST on 03/06/2013. The 18z GFS forecast above shows a low position near the Delmarva coastline with a 996 mb surface pressure. Note the 1032 mb high to the north over eastern Canada. This difference in pressure will create a strong onshore flow from NJ on south to the MD coast. This could lead to minor-moderate coastal flooding, strong winds, and much aggravation for NJ, DE, MD, and coastal VA residents. Central VA: Expect rain slowly changing to snow with light accumulations around the Richmond area. DC-Baltimore: Maybe, and I stress maybe, some rain to begin, but changing over to snow Tuesday evening. Accumulations starting out around 6″-8″, more to the west, less to the south. Would not be surprised to see areas along the I-95 corridor breaking the 12″ mark with the potential for thundersnow and strong winds. Power outages could be possible! Coastal NJ: Rain to start and could get heavy at times, especially south of Toms River. Winds increasing to 30-40 mph with gusts 50-60 mph or higher. Coast flooding could be an issue with early estimates of 2′-3′, but check your local NWS office for more details. Rain could change over to snow later on Wednesday with a quick thumping of 1″-2″ possible. If the model trends continue north, then more snow will be possible. Considering it’s still a bit early, I’m going to keep this brief. Yes, there is a growing storm potential for next week. No, I don’t know who will get snow, rain, or nothing at all. But, I’m getting increasingly concerned about a major coastal flooding event midweek regardless of the exact track of this storm. 12z GFS forecast for sea-level pressure and 6-hour accumulated precipitation valid at 7 pm EST on 03/07/13. The 12z GFS from this morning showed a rather scary scenario with a moderately strong low pressure system strengthening near the Delmarva Peninsula by 7 pm EST next Wednesday. This would lead to very strong winds along the coast and inland, heavy rain along the NJ coast, and heavy snow from Richmond up through Philadelphia. 18z GFS forecast for sea-level pressure and 6-hour accumulated precipitation valid at 7 pm EST on 03/07/2013. To contrast the morning GFS run, the afternoon (18z) GFS run just came out and looks very different. In this scenario, the storm passes far enough south to completely miss NJ, Philly, and DC. I think this is too suppressed based on the pattern, but it’s certainly still a possibility. Other computer models have been averaging between Charleston, SC and Cape May, NJ for low position. So why all the model mayhem? GOES-15 water vapor image of the East Pacific valid at 2330 UTC on 03/01/2013. 18z GFS initial 500 mb potential vorticity valid on 03/01/2013. The GOES-15 water vapor image above shows the culprits for the potential storm over the northeast Pacific. 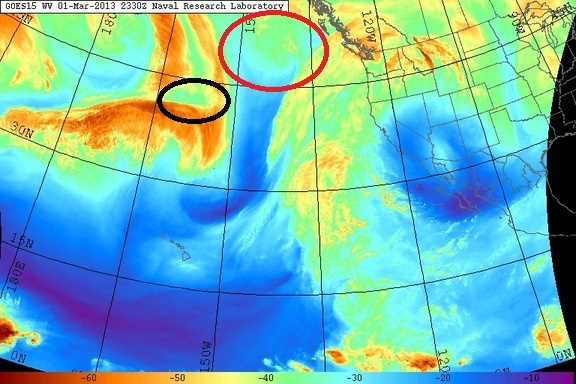 The disturbances highlighted with the red and black circles will combine in the next 24 hours and move over an amplifying ridge (bubble of warm air aloft) over the West Coast. The 18z GFS initial 500 mb potential vorticity (a fancy way of showing the disturbances in the water vapor image with values) shows the combined areas of energy that will lead to our big storm. Over the weekend, I would expect the models to flip back and forth a bit more. We will have a much better idea by Monday, but my hunch is that this will be a big deal. I have been wrong before. . . Although the National Weather Service is not too excited with the system for tomorrow into Thursday, I’m a little concerned. The storm will be strengthening once it hits the Mid-Atlantic coastline, which could promote something called “dynamic cooling”. This occurs as precipitation falls through the column helping to lower surface temperatures, while colder air also moves in from the northwest. If “bands” form, then the snow could fall heavier in certain locations. This is a borderline situation and will require forecasters to “nowcast” the event tomorrow, so don’t be surprised if snowfall amounts change. Sterling, VA NWS total snow accumulation map for 2/13/13-2/14/13. When you look at the snowfall map above, the I-95 corridor looks to escape most if not all of the snow. My personal feeling is that we should see more snow in this area, especially if the dynamic cooling is realized tomorrow evening. I do agree with the storm starting as rain though. 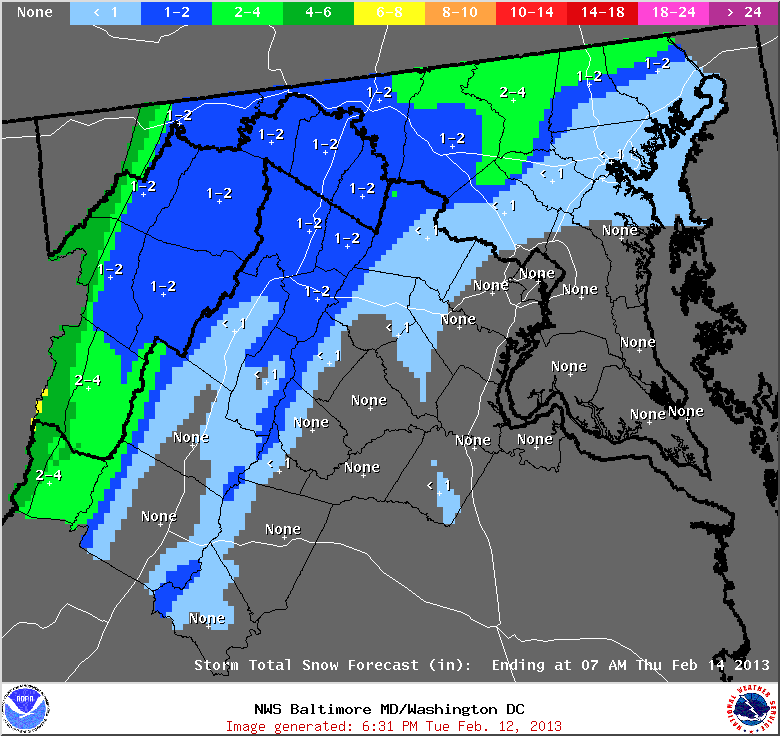 My forecast numbers for DC area 1″ or less, while the Baltimore area could see 2″-4″. I do think there is a tight gradient with this event. Farther north, the Mt. Holly, NJ NWS office has not issued a snowfall map. I think it’s possible that snow falls in NJ tomorrow night, with higher amounts possible along the coast. If I was to go out on a limb, I would say 2″-4″ as a general early forecast. Remember, this is my current idea and could change tomorrow morning. 18z GFS surface pressure and precipitation forecast for 03z (10 pm EST) on 2/13/13. 18z NAM surface pressure and precipitation forecast for 03z (10 pm EST) on 2/13/13. My support for the more snow option is in the two models above. The dashed blue lines represent thicknesses which we relate to temperatures between the surface and 15,000 ft. When those lines move south and east, it indicates cooler air moving over any given location. There should still be precipitation falling when the first blue dashed line (540 dam) thickness moves through the DC/Baltimore area. This would promote a changeover to snow by early to mid-evening. Now, the European model is drier and a bit warmer, which might be why forecasts are moving away from the snow option. Bottom line: I think forecasts will change tomorrow and there will be more of a snow threat heading into the overnight period tomorrow night into Thursday. This is not a big storm by any means, certainly nothing like the last storm. I am going out on a limb with very little support, especially from the NWS, but I’m going to follow my gut. If things look different by tomorrow morning, I’ll issue an update. Wow, I have been neglecting you all! I apologize and will try to get back into writing on here. This is just a quick note on the less-than-impressive snow event forecasted for tomorrow (Friday, 1/25/13). It’s another fast moving system that will blanket areas from DC to Baltimore and up into NJ with about 1″-2″, while there may be a few lucky areas that see around 3″. The reason for the isolated higher amounts is related to some technical meteorological jargon that most don’t care about, but the key word is “banding”. If your house is under a band, it snows harder. My house is never under a band. . . Anyway, I have provided the National Weather Service (Sterling, VA and Mt. Holly, NJ) snowfall maps for tomorrow below for your viewing pleasure. My forecast ideas are identical on this one, so I don’t have much more to add. Mt. 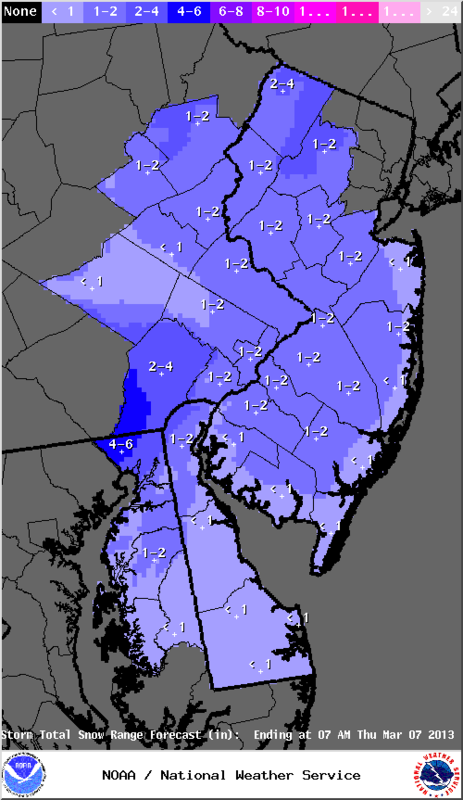 Holly, NJ NWS snowfall map for Friday, 01/25/13. 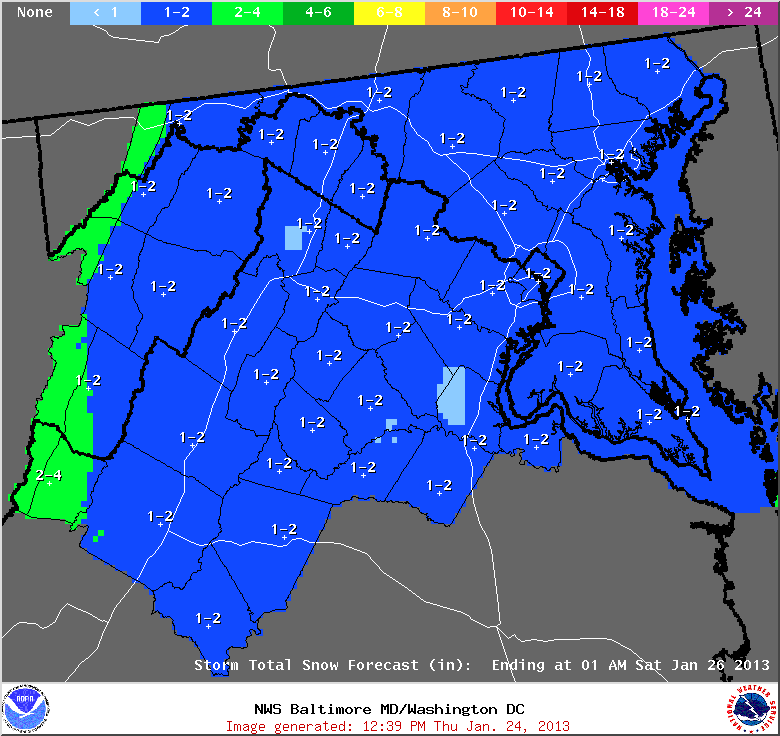 Sterling, VA NWS snowfall map for Friday, 01/25/13. If you are looking forward to a big snowstorm, join the club as that won’t be happening anytime soon. For those wishing for warmer temperatures, you will be very happy with the forecast for next week when we climb out of the ice box. But do not fear, February looks to greet us with more cold and maybe a stormier pattern. Don’t groan! I’m happy to finally see some semblance of Winter! As we mark the final day of the 2012 Atlantic Hurricane Season (and our weather remains boring), we have witnessed a few mid-latitude storms that have included elements of convection and even hurricane-force winds. After working with the Ocean Prediction Center (OPC) last winter, I was amazed at how many hurricane-force extratropical storms occur during a typical winter. Could you imagine if we named all of those? These storms are winter’s version of the hurricane, but are far more expansive than their southern cousins. This post will focus on two storms in particular that have kept the forecasters at OPC quite busy in the last few days. I created a four day animation of the complicated West Coast trough (large-scale storm system) that spit out a couple different waves of low pressure that included wind gusts along the CA and OR coasts over 70 mph and very heavy rainfall. The main highlight of this animation is the Vaisala GLD-360 30-minute accumulated lightning that is overlaid on the infrared satellite image where you can see multiple lightning pulses in the frontal bands, then a secondary area in the cold-air cumulus under the cold-core upper lows. It is interesting to observe how the lightning diminishes in frequency as the convective elements move into the near-shore waters. Can anyone guess as to why this occurs? On the Atlantic side, a storm rapidly intensified as it passed just east of New Foundland overnight. The SEVIRI RGB Air Mass animation above shows this evolution with the Vaisala GLD-360 15-minute lightning accumulation overlaid to get a better idea of how the convection evolved along the cold front east of Bermuda. The main highlight in this imagery is the intense pinks/reds that are indicative of a significant stratospheric intrusion. This intrusion originates farther west over Quebec and moved towards the developing potential vorticity (PV) anomaly that was moving offshore of New England and Nova Scotia. This interaction led to explosive cyclogenesis in the Northwest Atlantic with the storm deepening from 995 mb at 12z on 11/29/12 to 950 mb at 12z on 11/30/12. That qualifies as a cyclonic “bomb” dropping 45 mb in 24 hours south of 60N! Very impressive! SEVIRI RGB Air Mass image with the ASCAT high resolution winds overlaid valid at 19z on 11/30/12. To further demonstrate this storm’s power, I have overlaid the ASCAT high resolution winds on the Air Mass image to show how close the surface winds match up to the red-coloring associated with the stratospheric drying. The highest winds observed in this image are near the tip of southern Greenland (coincidentally called the “Tip Jet”) where ASCAT picked up winds near 65 knots or 75 mph. The larger area of brown with some embedded dark red wind barbs are winds of 50-60 knots (58-70 mph). Notice the large gap in ASCAT coverage in the eastern quadrant of the cyclone. It is quite possible that this area is experiencing winds in excess 60-65 knots! AIRS Total Column Ozone Retrieval valid at 19z on 11/30/12. Warmer colors indicate higher levels of ozone. The final image of this post is the 20z AIRS pass showing the higher concentrations of stratospheric ozone especially closer to the source region for this particular intrusion. I would expect to see much more ozone farther east, but the largest concentration of greater than 350 Dobson Units is sitting over eastern Quebec and New Foundland, which would indicate to me that this system is still maturing. Considering the relative lack of interesting weather across the lower 48, the Pacific and Atlantic basins are quite active, keeping the forecasters at OPC quite busy over the next few days. Thanks for reading!